Its latest test, simulation, and monitoring systems for 911, E-911, and NG-911 networks, systems, and protocols. Mr. Kulkarni further explained, “Automatic Number Identification (ANI) is a 8 or 10 digit landline caller telephone #, that in the conventional PSTN, is an index into the Selective Router (SR) database for the responsible PSAP # and the Master Street Address Guide (MSAG) database for the actual street address of the caller. Wireless callers have no fixed location, therefore a Pseudo Automatic Number Identification (pANI) is provided. The pANI is a code for the location of the wireless caller by cell site/sector in the Automatic Location Identifier (ALI) database. VoIP uses something similar called ESRK/ESQK (Enhanced Services Routing Key) for identifying the specific PSAP # and the caller location. Each carrier network is responsible for maintaining location data for their subscribers, updating the ALI database, and nearest PSAP # , all indexed to the ANI, pANI, ESRK/ESQK codes. He added, “CAMA - Centralized Automatic Message Accounting is a special analog trunk originally developed for long-distance billing but is now mainly used for emergency call services: 911 and Enhanced 9-1-1 (E-911). CAMA trunk connects a carrier switch directly to the Selective Router (SR), a special 911 Switch that in turn connects to many PSAPs. CAMA Signaling Simulation and Monitoring is accomplished using GL’s MAPS™ CAS Emulator and MAPS™ FXO FXS Emulator hardware and software applications. 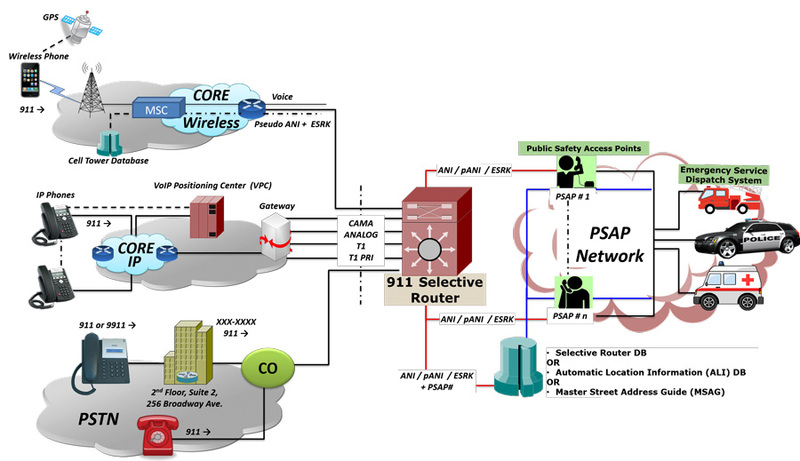 Similarly, MAPS™ ISDN Emulator and MAPS™ SS7 Emulator can perform 911 messaging and analysis over ISDN/PRI and SS7. All of these are strictly over a TDM network.